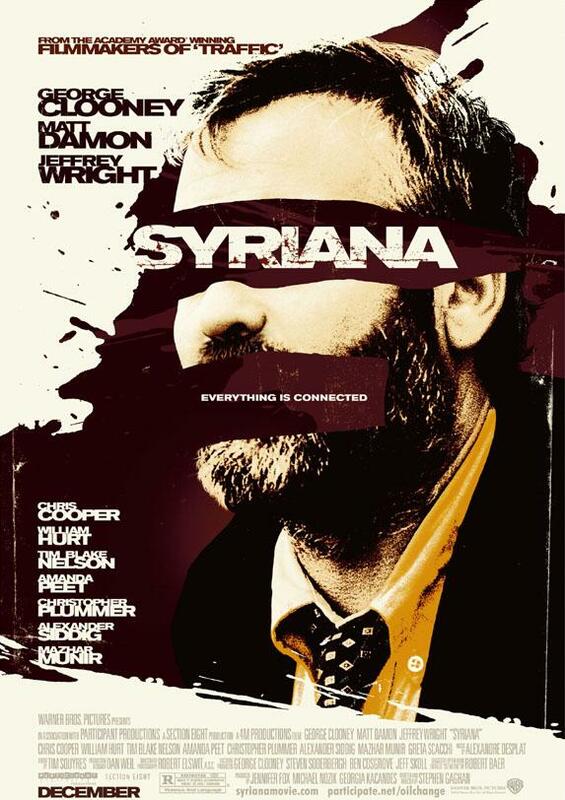 Syriana, directed by Stephen Gaghan, is a dense and complex film. It covers a lot of ground in it’s 2 hr. 8 minute running time and doesn’t wait to hold the viewers hands. This film is confusing at times, not because it is poorly made, but because many of the plot points and motives are left for the viewer to unravel herself. For those who care to watch it, this is a challenging, yet rewarding film. An example of the “hyperlink cinema” that has emerged in the 00s (a term wrongly credited to Roger Ebert, though he popularized it in his review for this very film), this film merges many narrative threads into one movie. Sometimes the paths of these disparate characters cross… sometimes they don’t. There are three main storylines present, one involving the top billed George Clooney as a CIA operative, one involving Matt Damon as an energy trader, and one involving Jeffery Wright as a government lawyer looking for foul play in an oil company merger. What these characters have in common is that they are invested in the international oil business in one way or another, and they are all waiting to see who take the throne of Syria. One heir wants his country’s commodity to be sold to China, the other the United States. Oh, and I haven’t even mentioned storyline that puts a human face on the “Joe Sixpacks” trying to make it in the Middle East. All of the above characters are good, and evil. All of them have complex human characteristics not normally shown in movies, even those that only follow one or two characters. Even at it’s long running time, the audience feels like they have just scratched the surface of these people that inhabit Gaghan’s film. No one will ever consider this the work of a master visualist, but Gaghan does keep things nice, using various saturations to add a style to the film. Also very neat is how he keeps “energy” in the background of the film and the characters life. This is a very nice touch, and touches on how we all rely on oil in our daily lives. For example, most scenes have power lines, oil tankers, derricks, and in one important scene an electric light bulb, in the background as our characters interact. Sometimes they are just drawings or on a logo, but they are often there. If you couldn’t tell by now, I am giving this film a strong recommendation, acknowledging that the film has some bumps. It’s in the dump bin for $5 at many fine retailers so it’s the perfect time to catch it if you missed it the first time around.